After our late breakfast, we decided to hit a clothing store before everything shut down for the afternoon riposo (Italy’s version of the Spanish Siesta). Justin was in search of a men’s carryall (It’s not a purse, it’s European!) so we decided to hit Scaringi, a clothing store in Misterbianco that has a decent selection of Men’s clothing and accessories. We struck out with the men’s carryall but look what I found in the parking lot! Like I’ve said before, you just never know what you’ll run across in Sicily. Isn’t this the scariest looking tree you’ve ever seen? It took about ten minutes of googling when we got home, but I figured out that this is a Floss Silk Tree. And guess what? They grow in San Diego, too! I guess I’d better watch my step when I get there! The cool thing about this tree was the contrast between the frighteningly evil-looking trunk and bright beautiful flowers hanging off the branches. It was really quite amazing and I have no idea how I missed these trees all the other times I shopped there. If you’re interested, you can go check out some more spiky tree photos on my flickr page. 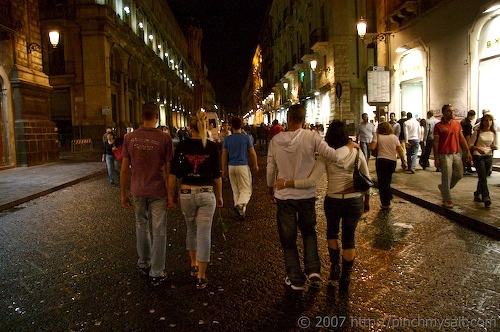 After shopping, we came back home for our own ‘riposo’ and decided to head out to Catania later in the evening to continue the quest for a decent man purse. 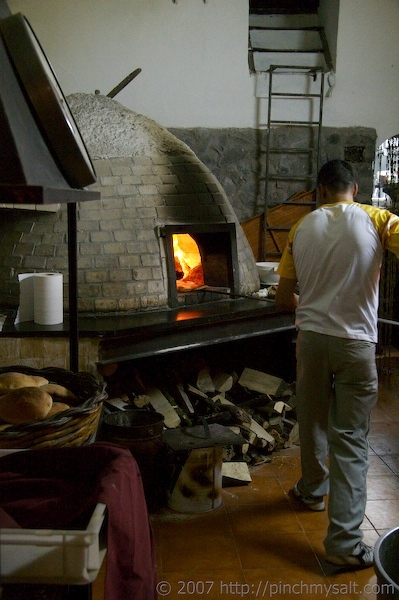 Riposo in Sicily generally lasts from 1 pm until 4 pm. Pretty much everything closes up except for restaurants and bars (I’m talking about espresso bars, not whiskey joints). And then most businesses grudgingly open their doors back up by around 4:30 or 5:00 and will continue to do business until about 8pm. 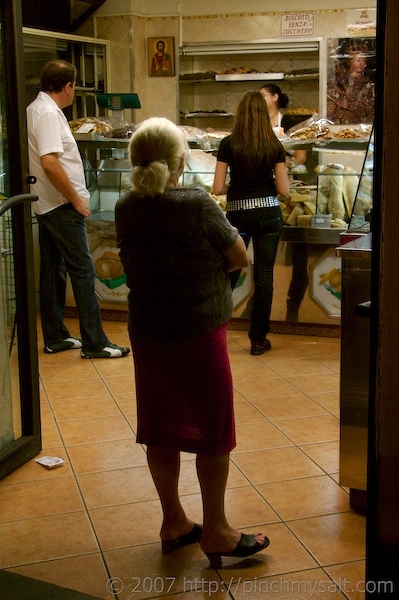 It’s a completely different lifestyle because many Italians are still working during a normal American dinner time. Dinner time here is 9 pm or later and most restaurants will not even be open before 8 pm. It’s not uncommon for large groups of people, kids in tow, to come rolling into a restaurant at 10 pm or later on a weeknight. 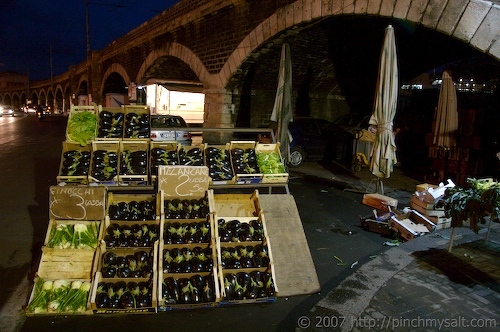 So what do Sicilians do in the evening when most Americans are eating dinner or passed out in front of the TV? 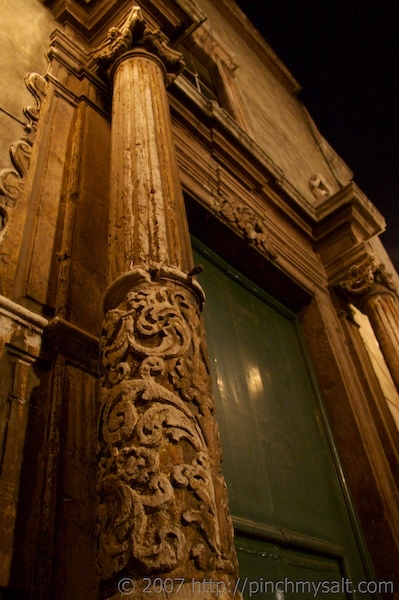 I love wandering around Catania after dark. The city comes alive. 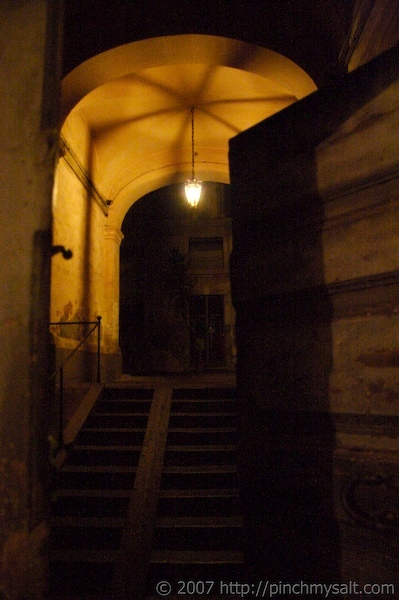 The dirtier, crumbling aspects of the city disappear with the sun and streetlights bring alive baroque details along side streets and in shadowed courtyards. We did eventually find a bag for Justin, and then it was time for pizza! The restaurant was too dark to take photos of our actual pizza, but I did manage to get a shot of their pizza kitchen on the way out. I would love to have one of these ovens in my house! While we were eating pizza, it started raining. At first it was nice because we were sitting on the second floor, and our table was next to an open door that led out to a covered terrace. We could hear the rain and it was relaxing. And then it started raining harder. And then it rained harder. Then it was raining so hard that the rain was coming in the restaurant so we had to close the door. I didn’t think much about it until it came time to leave. As we were walking down the stairs we noticed a group of people gathered around the exit. It was then we realized that we were trapped. 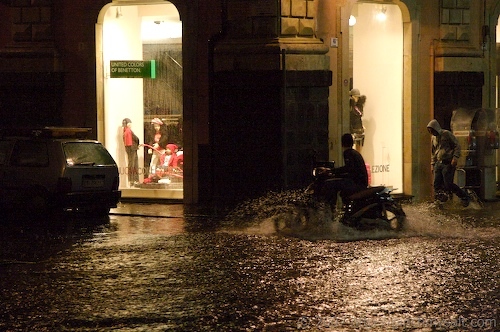 You see, the streets in Sicily don’t drain. When it rains hard, the streets turn into rivers. Since it’s been a while since I’ve experienced it, I had forgotten how bad it can get. The water outside the door had risen so much that we would have had to wade through it. But, the restaurant owner quickly took care of the problem. They somehow managed to build a bridge to get us across the water to a dry patch. It wasn’t until we crossed the makeshift bridge that we saw the real problem. Remember the photo earlier in the post, where people are walking down the street? Well, this is the same street a couple of hours later. Again, we were trapped. We huddled under the umbrella we purchased from one of the enterprising street vendors who were out wading in the water and I managed to take a few photos. But we saw some crazy things that I wasn’t able to photograph. 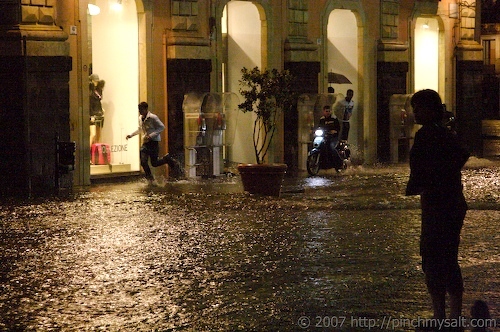 We saw restaurants and stores flooded, cars and scooters stalled in the road, an old woman bravely wading across the river (street) with water up above her knees, two friends fall into a manhole at the same time (the lids of the manholes had been washed away). It was crazy. Ambulances and fire trucks were everywhere. All of this had happened in the time it took to eat some pizza. Luckily, the rain slowed and the water started to recede after a few minutes. We did have to wade through some ankle-deep water a few times as we made our way back to the car but at least we didn’t fall into any manholes! If you haven’t already, don’t forget to read part one of A Weekend in Sicily. More pumpkin recipes coming up! Yeah, when I finally had to just wade through the water, I tried really hard not to think about what I was walking in. For one thing, we weren't too far from the huge outdoor fish market so there was a pretty good chance we were wading through some fish guts, among other things. There was also garbage everywhere because all the trash cans had been picked up and washed away. All the cars parked on the street were hit by fast-moving metal trash cans. For once I was happy that we parked far away! Please don't keep me in suspense! What happened to the 2 people who fell into the manhole? I will miss your wonderful "slice of life" posts from Siciliy. I wish you the best of everything as you move back to the States. Mimi: Ok, here's a little more about the guys who fell in the manhole. It's a funny story only because they didn't get hurt. When we first ventured out as the water started receding, we heard some people singing and laughing behind us. We turned around and a group of friends had walked out of a building covered in large black plastic bags. Their homemade 'rain suits' were hilarious and they were having a great time running through the water. We were all laughing about it as they passed us by. A few minutes later, I heard one of them yell and saw him fall down, a split second later, his friend fell too. At first I thought that one had slipped or tripped on something and pulled his friend down with him. Then we realized that all the manholes had lost their covers and water was pouring out of them, making them difficult to see. The first guy had stepped in the hole and fallen down then his friend stepped in the same hole as he was trying to help him. They weren't injured at all and they were laughing even harder than before. It was one of the funniest things I've seen since I've been here (and I've seen a lot of funny things)! Thats cool stuff. Too bad that didn't happen when Corinne and I were there, it would have been fun. Did your house flood? A lovely, fascinating story well told, Nicole. The late night dining in Sicily reminds me of Paris. No matter how late we went out for dinner, we always seemed to be among the first in any restaurant. Maddeningly, though, even though Parisians are night owls, the Metro shuts down at midnight! And taxis only want to pick you up at taxi stands; you can't just flag them down as you can in Chicago or New York. We took lots of long late night walks to get back to the apartment where we were staying. Flooding aside, these last two posts have me dying to hop on the next plane to Sicily. How wonderful that you lived there for a while! You mean that idiot doing something MORE illegal than what we were doing and hitting us? That was pretty funny.Didn't we go to Coin? Evie: Thanks!Jason: Yes, that's the incident I was referring to. And yes, we most likely went to COIN when you guys were here but I'm not positive. 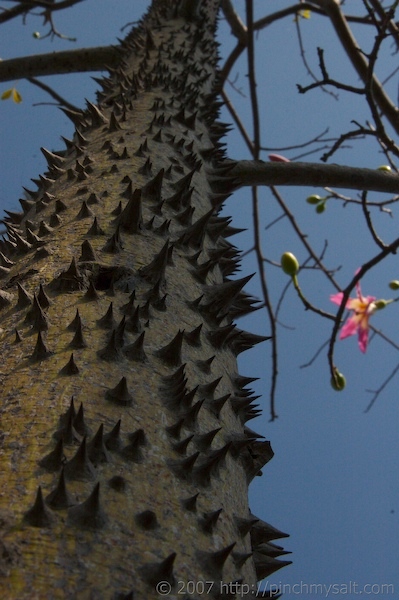 I just had to tell you that I had a Floss Silk Tree in my back yard when I lived in Los Angeles. My boys were little and it use to always scare me that they'd get impaled on one of the spikes. I had it cut down, it just gave me too much anxiety. Jules: There is no way that I would want this tree anywhere near a children's play area! I would have had it cut down too! Those spikes are sharp! wow Nicole! What an adventure! This rain was amazing indeed! Bea: Yes, it was definitely an adventure! Sounds like you had a great time in France! Wow. I have never seen a Hershey Kisses tree before......yummy! wow, you really sound like an ignorant american.